Mathematics Education majors Gordon, left and Thorington, right. 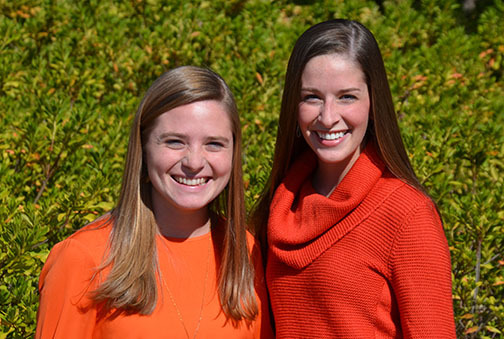 College of Education Mathematics Education majors Katherine Gordon and Amy Thorington have each been awarded $1,000 scholarships from the Alabama Council of Teachers of Mathematics (ACTM) for the 2014 – 2015 academic year. Both students will be interning spring semester. The scholarships were created by ACTM in order to promote the profession of mathematics teaching. The scholarships are awarded to junior/senior level undergraduate students who are majoring in Mathematics Education. Winners of these scholarships are selected on a competitive basis. Three such scholarships were awarded to students in Mathematics Education programs across the state for the 2014 – 2015 academic year. Both Gordon and Thorington have 4.0 GPAs. Congratulations!